Are you worried about the difficulty of wearing your gorgeous wedding dress during all the dancing at the reception? Do not fear because at soiréebliss! Events there is an answer for everything! There is a fabulous trend in the wedding world to have a dress flip after the ceremony. 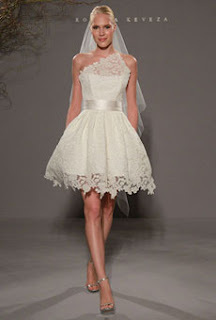 All the best wedding dress designers such as Monique Lhuillier, Ines Di Santo, and Rivini had fabulous short gowns all over the runway in the New York Bridal Fashion Week this year. These dresses are short, sassy, and absolutely perfect to allow the bride more comfort and let’s be honest, what girl doesn’t want another wedding outfit? Wedding dress boutiques offer wedding dresses of all lengths and sizes. Find one you love then go get a splash of color to make sure you stand out amongst your guests. Try incorporating your wedding colors by adding an adorable sash and bright colored shoes. But don’t stop there! Get some incredibly jewelry that will make you sparkle from head to toe. This dress change will be an eye catching surprise to your guests and you will be so much happier dancing in this dress as opposed to your 500 lb dupioni silk gown you walked down the isle in. Bottom line: it is your day, make a fabulous spectacle of yourself.